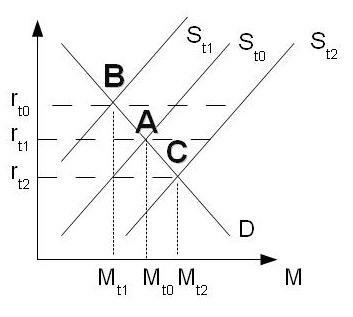 The equilibrium before the rise in the interest rate was point A. The Riksbank then cut the money supply/raised the interest rate so that we are in point B. Now what can happen is that money flows in from the rest of the world. This might shift money supply outwards, perhaps even overcompensating the central bank’s policy. We might end up in point C, where we have a lower interest rate and a higher money supply then before. This is exactly the opposite of what the policy intervention was supposed to do. What we would expect after a rise in the interest rate in Sweden is an appreciation in the exchange rate, so that the (uncovered) interest parity condition holds. (Which normally doesn’t work in the short run anyway, but that is not the point.) So, in order to buy Swedish assets, people have to buy kronor first. This makes the Swedish currency more expensive. The thing is that a rise in the exchange rate will benefit all those who moved into the kronor first, and might trigger a cumulative series of capital inflows, which would be self-validating. The subsequent rise in the kronor would always justify the prior investments, given that they are significant enough. Sweden is, obviously, not a part of the euro zone. Nevertheless, it is a significant part of the European economy and it will be interesting to see what happens. Will it play according to the (inflation-targeting) textbook, or will there be interference by the external situation? After all, there is a lot of capital going around, looking for a decent interest rate. A first indicator to watch would be the exchange rate SEK/EUR. However, now is much too early to tell.